I have to say, the guys at KPMG have put a lot of thought into this one, it had a bit of everything that helped keep the interest up, and it certainly wasn't straight forward. If you scroll down to the end of the garbled text you will see it ends with ==. This is a clue that this message has been encoded with Base64. this was flag 1 complete - an easy start. apt-get install knockd then ran ./knock <ipaddress> 79:tcp 123:tcp etc. A quick check with nmap showed port 80 was now open on the target. Okay so now we had credentials to log into the VM itself - allbeit with limited privileges. After a short wait, I could now use sudo su to become root and gain access to the file in the /root directory with details of the next flag. For this one, I was told that I should start up an Android emulator and try and bypass the authentication to the KPMG app. data/app/com.bsides.hackme-1.apk. The first thing i normally try is the strings command - just in case the information is stored in the clear. I downloaded the file via ADB and used strings to find the instructions for flag 6. This flag involved having to try and extract out n3ro's password from a windows memory dump. I really enjoyed this one, a quick google gave me the following article explaining how to use a forensic program called volatility to achieve this. Once I had the hash, Ophcrack made easy work of the password to complete the level. There are a few ways these can be extracted from the pcap file, firstly you could open it in the excellent NetworkMiner tool, or another way is to use Wireshark itself, by going to file - export - object - http. Looking through the part7.c I could see that it was a C program that used the other 4 files to produce the flag. I used gcc part7.c -o part7 && chmod 755 part7 && ./part7 to get the password for the zip containing flag8. This one I thought was very clever. It contained an mp3 file with a morse code message. At first I went searching around the internet to see if there were any sites I could upload this to, or a program I could download to use with my laptop's microphone maybe. I couldnt find anything, but then had the idea to use my IPhone - after all, "there's an app for everything" right? 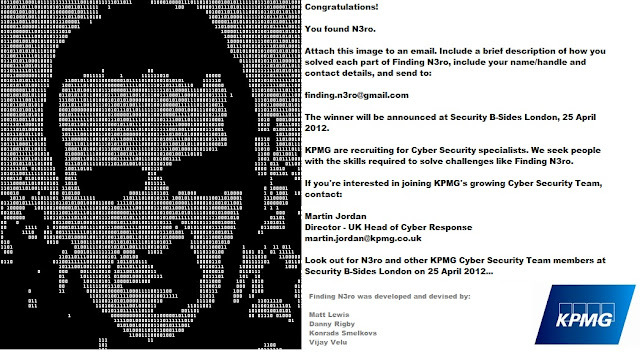 I would like to say thanks to those guys at KPMG for creating a very enjoyable challenge. I can appreciate the effort that goes into making one of these, so kudos to them.